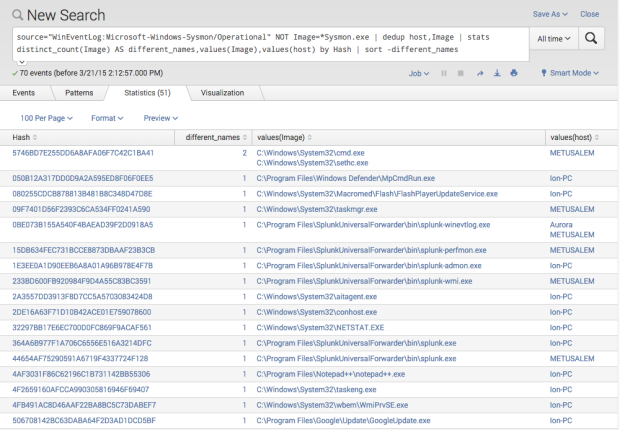 SysInternals Sysmon is a powerful tool especially when it comes to anomaly detection. I recently developed a method to detect system file manipulations, which I would like to share with you. We know how to track processes with the standard Windows audit policy option „Audit process tracking“, but Sysmon messages contain much more information to evaluate. By using Sysmon on many systems within the network and collecting all the logs in a central location you’ll get a database full of interesting attributes and Metadata which can be statistically analyzed in order to identify anomalies. Carlos Perez wrote a really good article on Sysmon, which you should check out if you’re new to Sysmon and its capabilities. In recent years „anomaly detection“ has often been used as marketing buzzword and as a result lost some of its shine. I am still a strong believer and often phrase sentences like „anomaly detection is the only method to detect yet unknown threats“. In security monitoring we call it anomaly detection, Antivirus vendors call it heuristics and SPAM appliances evaluate it in a „X-Spam-Score“. Anomaly detection requires the ability to describe what is normal and exclude it from the evaluation. With the data collected from the different Sysmon sources, this is an easy task to do. Sysmon provides the executable hash as MD5, SHA1 or SHA256 in the log entries that enables an analyst to identify the few different versions of a certain system executable. A hash of a system program like „cmd.exe“ executed on the different systems on your domain should always be the same on all systems running the same version of Windows. But let me give you some examples. Let’s take a look at two analysis examples in which I use this method to identify different anomalies. It gives you an overview of files with the same hash but different names. It is pretty easy to spot the manipulation. If you create the statistics by „Image“ instead of „Hash“ you’ll get an overview of the different versions of system files in use and are able to identify system file versions that are unique. Look at the following example to get an impression what can be done with this method. I am sorry but I can’t give you a nice screenshot on what would it look like in a big environment. These are the results from 3 different demo systems only (Win2003, Win7 and Win8), but in order to see what it would look like in a environment with hundreds or thousands of systems, see the listing below. Consider the image files with a low count as anomalies and try to figure out, why the hash of the system executable is different from the variants on the other systems. I would google the hash of the black sheep, which is „D8B7B276710127D233ABCDB7313AAC36“ and see if I can get more details. An empty google result is NOT a good sign as some may be inclined to believe. If the google results are ambiguous you should try to figure out if these systems are somehow special – e.g. certain readout system on embedded OS versions, systems that do not receive patches. If the findings are still suspicious you should drop the samples in a sandbox and see how they behave. Hope you liked it. Please give me feedback if you actually tested this method in your environment so that I can improve the search statements or handle false positive conditions.